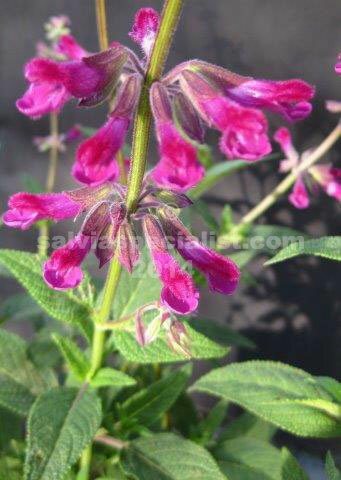 This is an Australian hybrid from a Tasmanian gardener who only had 3 species of salvia in his garden at the time so it seems fairly definite that its parents are chiapensis and leucantha. It is a bit tender evergreen perennial less than 1m high. ‘Magenta Magic’ could use some pruning to thicken it up when it is young. Otherwise it is a worthwhile addition to the flower garden. It grows readily from cuttings or will layer. ‘Magenta Magic’ can tolerate some drought if established. Chiapensis is a very hardy persistent plant and ‘Magenta Magic’ has inherited some of these characteristics. It survives being smothered fairly well, i.e. for months!